You’d be forgiven for assuming Rayman Legends – the fantasy-tinged, dragon-singed sequel to self-contained 2D platforming renaissance Rayman Origins – was a wee-yoo exclusive. But with any luck, like its predecessor Legends will eventually slink sheepishly to the PC party, late but welcome. So we too can enjoy the 50 second teaser of its new character, the barbed Barbara. 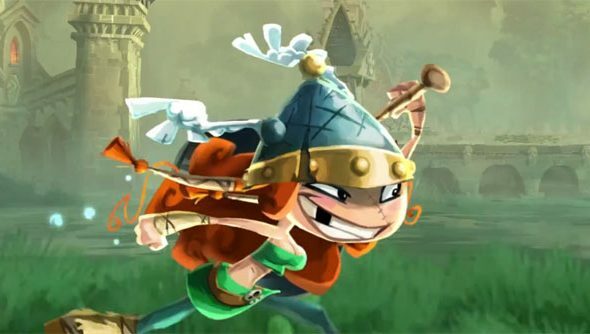 If there was any flaw in Rayman Origins’ exquisite carapace, it was the helpless, needlessly-buxom fairies who, once freed, granted the limbless one new powers. Barbara seems like a far less troublesome proposition. Recalling Jade of Ubi Montpellier’s Beyond Good and Evil, she is a flame-haired fighter who wields an axe and, more importantly, agency. See the trailer below.